Here is our Santa photo from the base Christmas party. It was a bit of a bust as Isaac refused to nap all morning. He was an absolute screaming mess when we left the house. We weren’t even going to go to the party, but home wasn’t working as Isaac was crying no matter what we tried. We figured a change of scenery might help, and at the very least a car ride would knock him out. Sure enough he got into his car seat, downed his milk and fell asleep. He was still asleep by the time we got to the base so I went in to sign-in and pick up his gift. By the time I was on my way back to the car he’d woken up so he and Jay came in. Needless to say, Isaac was a little subdued and still very tired, so he wouldn’t go to Santa for the photo. So instead you get an honest (if not perfect) family photo. Jason and I are still wearing our coats. Isaac’s pants are half way up his legs (at least his socks matched!! ); it’s actually a miracle we’re all looking at the camera. 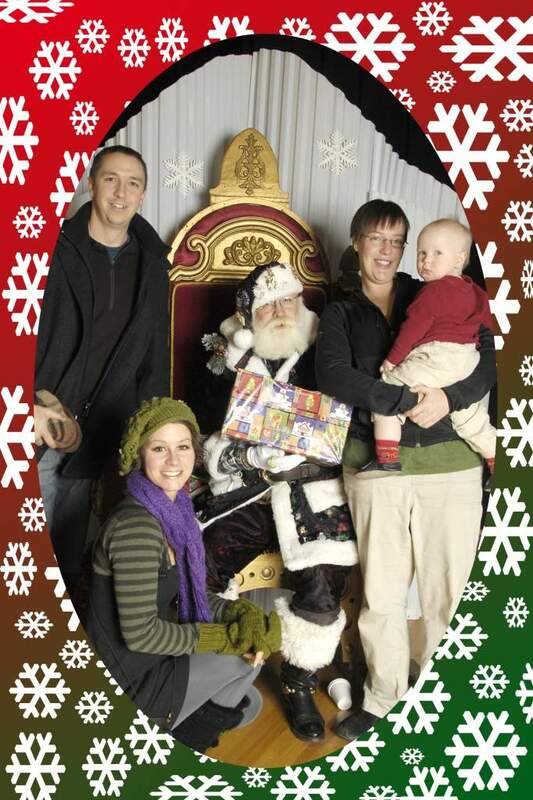 But here it is our 2009 Santa Photo in all it’s glory. That is an AWESOME family photo!!!! When my oldest was 1 and visiting Santa, we have a picture of him giving the camera ‘the bird’….even though it wasn’t really the bird. Ya, that was a keeper….being the good Christian family that we are..ha ha!! It was one to give to the grandparents, for sure!